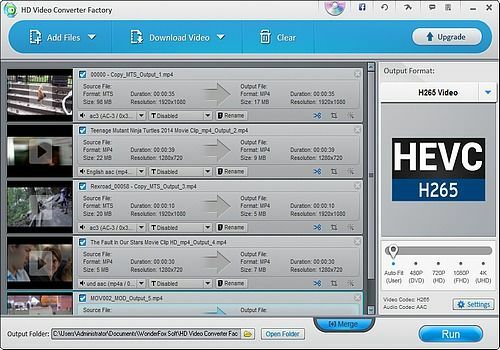 Free HD Video Converter Factory is a powerful but easy-to-use HD video conversion software. It owns the ability of converting videos to a broad range of popular formats and devices like AVI, MPG, MP4, WMV, MKV, MOV, M4V, iPhone, iPad, Samsung and more. New pop devices are keeping added. This free HD video converter supports Multi-CPU and Hyper Threading, and offers up to 30x real time video converting speed. What are the characteristics that distinguish WonderFox Free HD Video Converter from other HD Converters? The first and perhaps the most important point are the exclusive optimization technique and sharp pictures. It completely avoids the disproportionate aspect ratio and dull color of the output images, and is able to make the output video shown on the portable device in full screen. Secondly, users can select resolutions of the output video by simply dragging the number axis. In addition to the powerful converting function, it is also a video editing software. Like, merge multiple videos; trim and crop video; add special effects to video (mosaic, blur, sharpen, emboss, noise, old film, etc.) The free HD video converter is a completely free gift. It is designed and developed to deliver gratitude to your concern and support. We hope it can help you enjoy more HD videos and enjoy your life to the full! Laisser un commentaire sur WonderFox Free HD Video Converter Factory 15.0 Merci de rester correct et de respecter les différents intervenants.